Bombardier CS100 is a new twin-engine, single-aisle jetliner from Bombardier Aerospace. 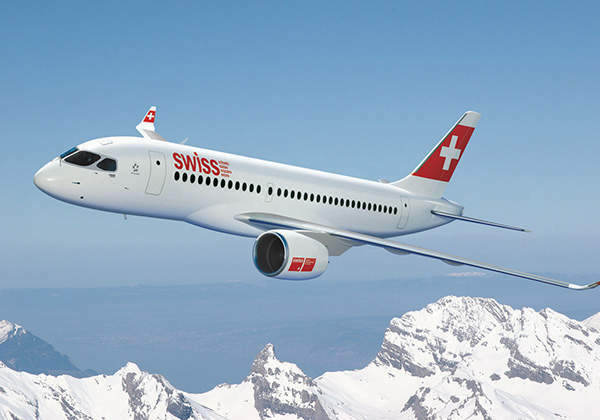 An artist's impression of the CS100 in the colour scheme of Swiss International Air Lines. A generated image of the Malmö Aviation CS100 aircraft. The CS100/CS300 series aircraft test cockpit at Saint-Laurent facility. The Airbus A220-100 (previously Bombardier CS100) jetliner is a single-aisle, long-range passenger aircraft developed by Bombardier Aerospace. The CS100 can accommodate 100 to 125 passengers based on the seating configuration. Bombardier Aerospace launched the CSeries aircraft programme in July 2008. 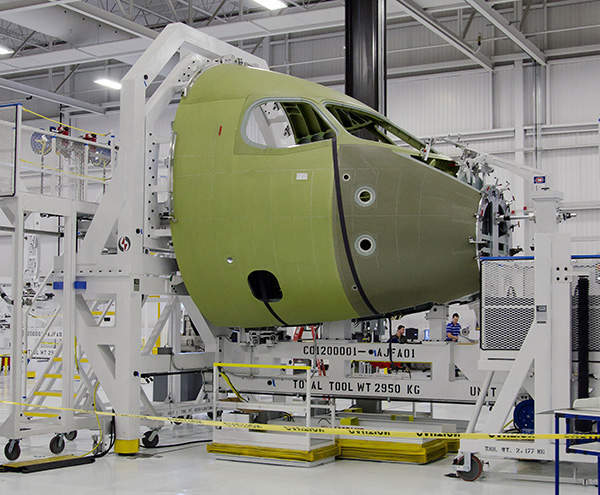 The CSeries includes two models: CS100 jetliner with options of 100 to 125 seats, and the CS300 jetliner with 130 to 145 seat layouts.Systems integration began at the Complete Integrated Aircraft Systems Test Area (CIASTA) in April 2012. The first flight was completed at Montréal -Mirabel Airport in Québec in September 2013. The aircraft obtained a type certificate from Transport Canada in December 2015. The aircraft secured type validation by European Aviation Safety Agency (EASA) and the Federal Aviation Administration (FAA) in June 2016. The first aircraft was delivered in July 2016. 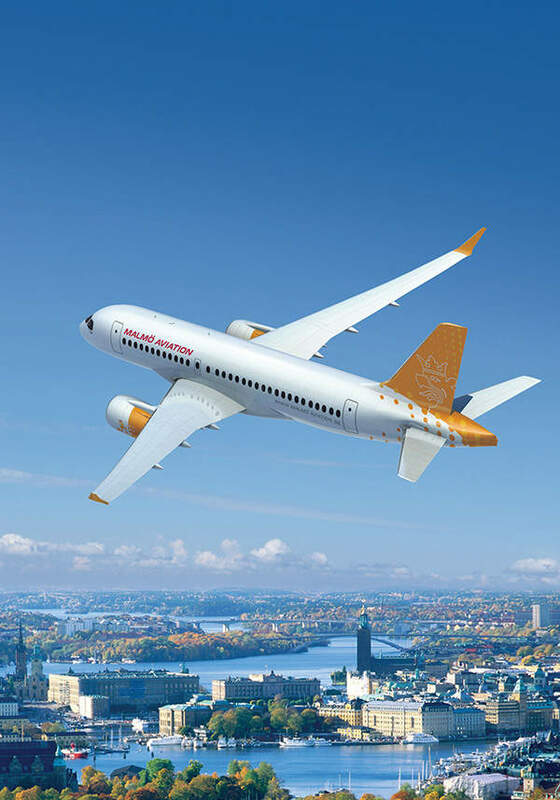 The aircraft was renamed A220-100 following the sale of 50.1% stake of the Bombardier C Series to Airbus in July 2018. In March 2009, Deutsche Lufthansa signed a firm purchase agreement with Bombardier for 30 A220-100 aircraft for its subsidiary Swiss International Air Lines. SWISS converted ten of its 30 firm-ordered A220-100 aircraft to A220-300 aircraft in June 2015. SWISS received the sixth aircraft in March 2017. Braathens Aviation placed a firm order for five A220-100s in June 2011. An unidentified European customer placed a $628m firm order for ten A220-100 aircraft in the same month of that year. In January 2012, PrivatAir placed a firm order with Bombardier for five A220-100 aircraft. The contract also includes options for an additional five aircraft. In July 2012, CDB Leasing Co (CLC) placed a $1.02bn conditional order for five A220-100 and ten A220-300 jetliners. The purchase agreement was revealed in October 2013. It also includes options for an additional five A220-100 and ten A220-300 aircraft. In July 2014, Petra Airlines signed a letter of intent (LOI) for two A220-100 and two A220-300 aircraft. Zhejiang Loong Airlines also signed a LOI for 20 CS 100 aircraft in the same month. Falko Regional Aircraft (Falko) signed two LOIs for up to 24 A220-100 aircraft in July 2014. JetBlue placed an order for 60 A220-300 aircraft in July 2018 and the deliveries are expected to begin in 2021. Airbus booked approximately 400 A220 orders as of November 2018. 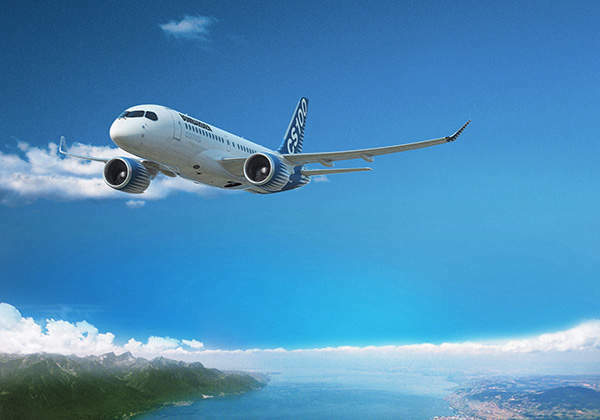 The CS100 aircraft incorporates a clean-sheet design. The airframe is made of advanced structural materials for achieving weight savings. The fuselage is made from aluminium. Advanced composite materials have been used for the empennage, rear fuselage, nacelle and wings. Advanced materials are composed of advanced composites (46%), aluminium-lithium (24%), standard materials (21%), titanium (8%), and steel (1%). The CS100 aircraft is equipped with a Rockwell Collins Pro Line Fusion integrated avionics system. The advanced flight deck accommodates two-member flight crew, comprising a pilot and co-pilot. 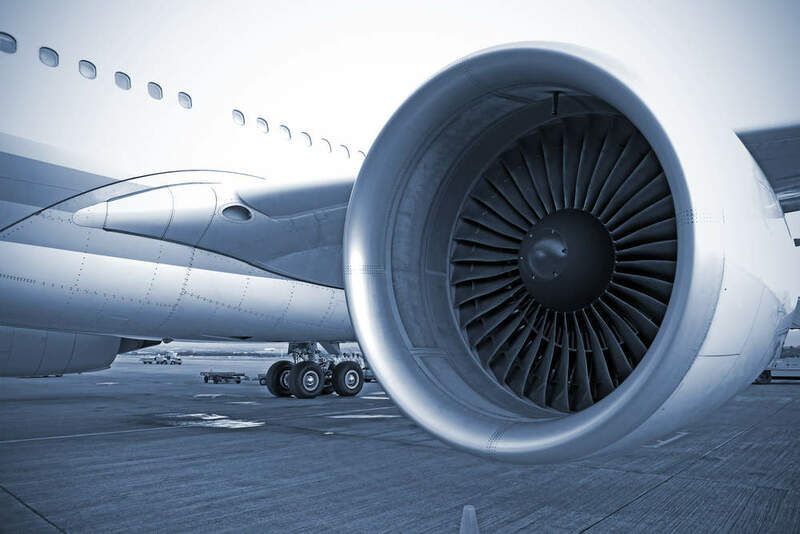 It incorporates large LCD displays, dual-flight management system, dual cursor control devices, navigation, communications, surveillance, engine indication and crew alerting system (EICAS), and aircraft maintenance systems. The flight deck can be equipped with an optional dual electronic flight bag, single or dual head-up display (HUD), and Cat IIIb autoland capability. The line-replaceable modules (LRB) are housed in two physically separated cabinets to ease the maintenance and optimise weight. The CS100 aircraft features a five-abreast cabin delivering more seat width for every passenger. The extra large windows offer better view angles. The cabin offers highest overhead bin volume per passenger compared with that of the currently in-service narrow-body aircraft. The aircraft features a wider aisle for quick boarding and de-boarding of passengers. The CS100 offers a variety of seating options to meet the requirements of the airlines. The interior can be configured for single-class seating (110 seats), mixed-class (100 seats), and high-density class (125 seats) seating. Bombardier Global 6000 is the most luxurious business jet built by Bombardier Aerospace. The CS100 jetliner is powered by two Pratt and Whitney PurePower PW1500G engines. Each engine can generate a maximum thrust of 93.4kN. It uses a fan-drive gear system, and advanced combustion technology for delivering high performance. The engine is monitored by an engine health display system. The CS100 aircraft is fitted with PW1500G, which offers a 15% lower operating cost and 20% fuel burn advantage over similar aircraft. The CS100 jetliner can fly at a maximum altitude of 40,000ft. It has a maximum cruise speed of 871km/h and range of 4,074km. The maximum take-off and landing weights of the aircraft are 54,931kg and 50,576kg, respectively. The fuselage is supplied by Shenyang Aircraft, and winglets are delivered by GKN Aerospace. The actuation systems and low-pressure distribution systems are provided respectively by Goodrich and Senior Aerospace. Alenia Aeronautica delivers electric and flight control systems, lights and antennas, while Fokker Elmo is responsible for the wiring and interconnection system.